The latest episode of Honest Trailers is here to take on one of 2018’s most unlikely box office hits, Venom. It would have been nearly impossible to predict just how successful Sony’s first Spider-Man spin-off movie, which takes place outside of the Marvel Cinematic Universe and doesn’t feature Spider-Man in it, would become. But director Ruben Fleischer delivered a crowd pleaser. Though, it’s a crowd pleaser that has its fair share of problems. We kick off with a nice jab from the voiceover guy calling Sony “the studio that Marvel lets play with their toys.” The trailer rightfully points out that a great many fans of Marvel Comics, specifically Spider-Man comics, had been wanting to see Venom on screen for a very long time. That is, until we got the regrettable Topher Grace version in Spider-Man 3. But this is the “gnarly, sick and tight” version of the character that is great for people who might use those aforementioned words in regular conversation. The video also makes the point that we’re running out of big-name Silver Age comic book heroes to adapt. So now, we’re moving onto the 90s, which brings with it leather jackets and attitude. This latest version of Honest Trailers also makes a point that has been made plenty in the past. Venom feels like a movie that could have, and probably should have been R-rated. It would have allowed for the violent nature of the character to truly come forward and much of what was seen in the cut we got wouldn’t have needed to be subverted. Then again, it’s very tough to argue with results and, for Sony, the results speak for themselves at this point. It both praises and condemns Tom Hardy’s performance in equal measure. But perhaps the best part, aside from hypothesizing as to whether or not Eddie Brock can taste the human flesh that Venom eats, is that this video positions the movie as a love story. Eddie Brock is torn between his love of Michelle Williams’ Anne and the symbiote that has bonded with him. Sony even seemed to understand this angle a bit, as they played Venom up as a romantic comedy in an ad for the home video release. Problems be damned, Venom has made more than $855 million worldwide, making it one of the biggest movies of 2018 overall. This, despite the fact that critics generally were dissatisfied with the adaptation, as it currently sits at a very poor 28 percent approval rating on Rotten Tomatoes. Then again, the audience rating is 84 percent, which, from Sony’s perspective, is much more important. This means we’re inevitably going to get Venom 2, which likely already has a 2020 release date locked down. So, if nothing else, we’ve got another one of these Honest Trailers to look forward to in a couple of years. 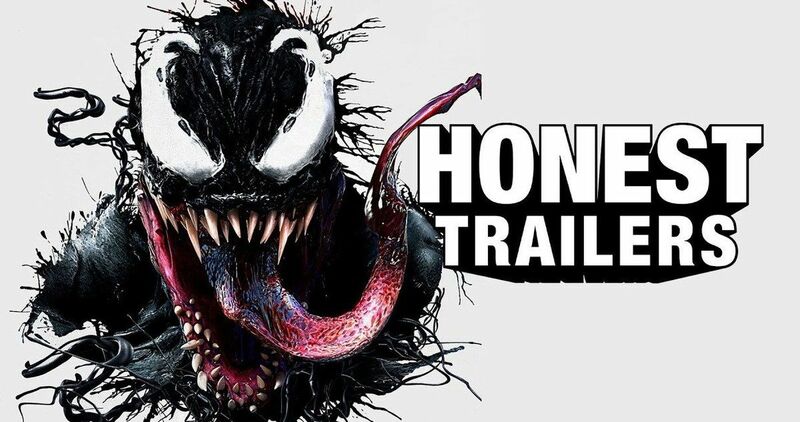 Be sure to check out the Venom Honest Trailer from the Screen Junkies YouTube channel below.